With generous support from the Heritage Lottery Fund, The World Monuments Fund, English Heritage, the local community and a number of Trusts and Foundations, £10 million was raised and the restoration of Strawberry Hill House & Garden was accomplished. It was opened to the public in October 2010 and in 2011 won the Georgian Group Award for the best restoration of an 18th century Country House and the Europa Nostra Award in 2013. 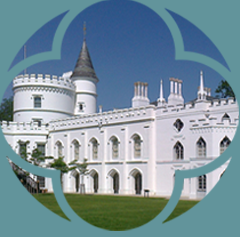 Strawberry Hill House is one of the best-documented houses in the country. Not only did Walpole leave ‘A Description of the Villa of Horace Walpole’ but he also described it in numerous letters and commissioned drawings by John Carter & paintings by Heinrich Muntz to record the changing appearance of the House. When restoration research began in 2004, these sources were critical to understanding the materials and details of Walpole’s original design. 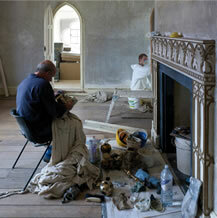 Work began in 2006 to restore all 25 show rooms to their appearance in the 1790s at the time of Walpole’s death. The roof was extensively repaired with new lead work and re-slated with Westmorland slate. Carved oak pinnacles were reinstated, castellated parapets restored to their original proportions and 19th Century chimney pots stabilised and repaired on the roof. The old exterior cementitious render was removed and replaced with new lime ‘harling’ (a lime & pebble stucco render) to restore Strawberry Hill to its original ‘wedding cake’ appearance. In the course of works, the Great Tower was found to be poorly repaired in the past and badly damaged. It was carefully dismantled and rebuilt using the original frame wherever possible. The same can be said of much of the Renaissance glass present in the House, much of which was removed and then restored off-site. 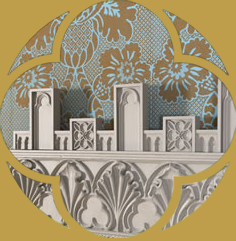 Visitors can see the process of restoration at the House in the Discovery Room, where different layers of wallpaper, Lady Waldegrave’s intricate bell system and restored windows are all laid bare.